Hainan Airlines’ parent company HNA Group is to take an equity stake in Virgin Australia as part of a new commercial alliance announced on Tuesday. The Chinese airline and aviation conglomerate and Virgin Australia have signed a heads of agreement to form a “strategic commercial alliance” where HNA will take an initial 13 per cent stake in Virgin Australia through the issuing of new shares under a $159 million placement. The alliance would also lead to the two airline groups introducing direct China-Australia flights as well as cooperating on codesharing, frequent flyer programs, lounge access and promotion of tourism and business travel, Virgin said. Virgin Australia chief executive John Borghetti said the proposed partnership HNA, with its various airlines and other strategic investments in ground handling, cargo, aircraft leasing and travel businesses, was a “big coup” for his airline. “For such a large company as HNA to recognise the potential of Virgin Australia and for that matter the potential of Australia is enormous,” Borghetti told reporters during a conference call on Tuesday. “We carry very little, almost no traffic on our domestic network from China in terms of percentage of the total. All of a sudden this will give us access to the 1.2 million people that come to Australia. The share placement will take place once HNA receives relevant Chinese government approvals, while the strategic alliance will also require the green light from Australia’s competition watchdog, the Australian Competition and Consumer Commission. The deal with HNA to take an equity stake and form an alliance with Virgin was separate from the airline’s group’s recently announced capital review, which was ongoing. However, the company said HNA was committed to supporting the outcomes of the capital structure review. Further HNA intended to increase its shareholding over time up to 19.99 per cent. While committing to begin flights to China with Virgin aircraft some time in the first half of calendar 2017, Borghetti declined to say which routes would be served or what equipment would be deployed to Australia’s fastest growing inbound tourism market. Further, Borghetti said the two carriers would offer a “significant” schedule, with at least a daily frequency between Australia and China. “If you look at what we’ve done as a company over the last five years or so, we firstly established a good credible domestic network with good frequencies,” Borghetti said. “The next step was to build an international long-haul operation that fed major hubs for outbound travel from Australia such as Los Angeles, Abu Dhabi and so on where we feed our partners. Hainan Airlines is China’s fourth largest airline and has previously operated flights to Australia on two occasions, most recently a short seasonal series of twice weekly flights between Xi’an and Sydney which operated between December 2015 and March 2016. It first launched flights to Sydney in January 2011, when it served Sydney on a Hangzhou-Shenzhen-Sydney routing. However, it pulled off the route a year later. Privately-owned HNA would become the fourth major airline on the Virgin Australia share registry, alongside Etihad, Singapore Airlines and Air New Zealand. But the latter signalled in March its intentions to sell off all, or part, of its 26 per cent stake in Virgin. The HNA placement values Virgin Australia shares at 30c each. Although that is significantly lower than what they were trading at at the time Air New Zealand announced plans to exit its stake, it represented a 7.2 per cent premium to Monday’s closing price of 28 cents a share. The transaction would also dilute the existing major shareholders’ stakes in Virgin. Figures from the company indicated Singapore Airlines’ stake would fall from 22.8 per cent to 19.8 per cent, Etihad Airways would drop from 24.2 per cent to 21 per cent and Sir Richard Branson’s UK-based Virgin Group holding would be eight per cent after HNA landed on the share register, from 10 per cent currently. Meanwhile, Air New Zealand’s ownership level would be 22.5 per cent after the HNA deal, from 25.9 per cent currently. 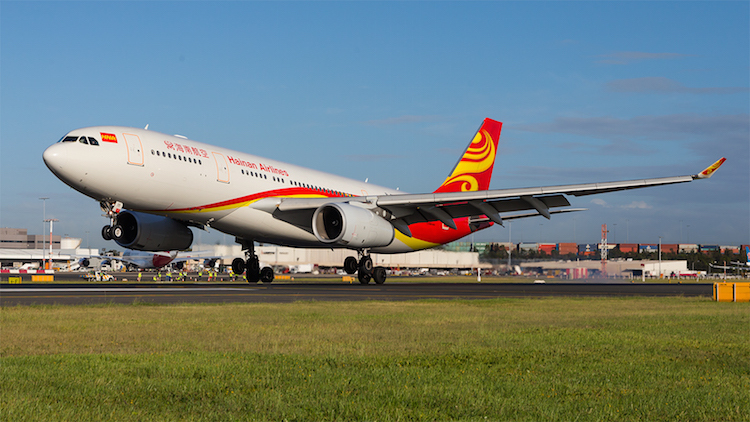 HNA said it was “committed to expanding in the airline industry through strategic investments in companies with strong market positions and excellent management teams”. “We are excited to support the Virgin Australia Group through our investment and the strategic alliance. We look forward to working together to create a seamless travel experience between Australia and to China and to deliver further choice, value and excellence to travellers worldwide,” HNA said. According to its website, as at December 2015 the HNA Group had a fleet of over 820 aircraft, operating flights to 200 destinations and carrying 77.4 million passengers annually. Airlines in the group comprise: Hainan Airlines, Tianjin Airlines, Deer Jet, Lucky Air, Capital Airlines, West Air, Fuzhou Airlines, Urumqi Air, Beibu Gulf Airlines, Yangtze River Airlines, Guilin Airlines, My CARGO, Africa World Airlines, and Aigle Azu. It also has strategic investments in aircraft leasing (Avalon), cargo, ground handling services (Swissport), hotels and travel agency businesses, and manages 13 airports. Borghetti said work on the capital review was ongoing. “We won’t have the results of that for a little while,” Borghetti said. Wonder if new aircraft will be ordered or they will pull A330s from Perth and replace them with 737s? So why is Virgin in the doldrums? Will Hainan make a difference or are they looking at a $159mill buy in to the Australian-China rout that they have twice attempted previously without success? This is interesting…. but is it really “good”, time will tell, however, we are all waiting for the fleet optimization for longhaul fleets in Virgin (777, 330) and the supposed expansion of Tiger….. which is 3 years behind! They all need to start getting 787’s or 350’s to match Jetstar, as they cant bleed money on routes that are unprofitable, e.g. the current widebody usage! Tiger need to expand, and fast, they need new carbon frames to maximize their efficiency and have their low fares pay-off! Just like Scoot! I dont think HNA will be enough money, even at 20% (320 million). It will be a minor boost to air-frames and most will be wasted on managers excessive pay packets and bonuses!? I am not confident considering Virgin/Tiger are doing international in a narrowbody!!!! lol. clunky slow 737 taking on a 787 or 330! lol I know which one I would choose! To Virgin passengers – your news alliance partner airlines are an esteemed crowd!!!! !Tianjin Airlines, Deer Jet, Lucky Air, Capital Airlines, West Air, Fuzhou Airlines, Urumqi Air, Beibu Gulf Airlines, Yangtze River Airlines, Guilin Airlines, My CARGO, Africa World Airlines, and Aigle Azu. This announcement is more about what isn’t said rather then what is. Dilution isn’t what Air New Zealand is looking for. What other deal is unannounced about the buyer of all or some of the ANZ share? Many laughed when I suggested Chinese investment when ANZ voted to get out. Where are you all now! Sounds dodgy issueing new shares when a major block of shares are available for purchase.